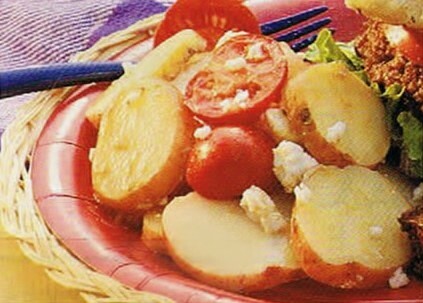 Loaded with flavor and just a fraction of the fat this is one of my favorite go to healthy potato salad recipes. Perfect for a picnic or a cookout because it doesnt contain any mayonnaise that could spoil in the heat. Of course, it also doesnt have the added fat that mayonnaise based potato salads have. Cook potatoes in boiling water (enough to cover potatoes) 12 to 15 minutes or until tender; drain and cool. Combine potatoes and next 3 ingredients in a large bowl; set aside. Combine vinegar and next 3 ingredients in a small jar; cover tightly, and shake vigorously. Pour over potato mixture and toss gently.